This is a biggie week! 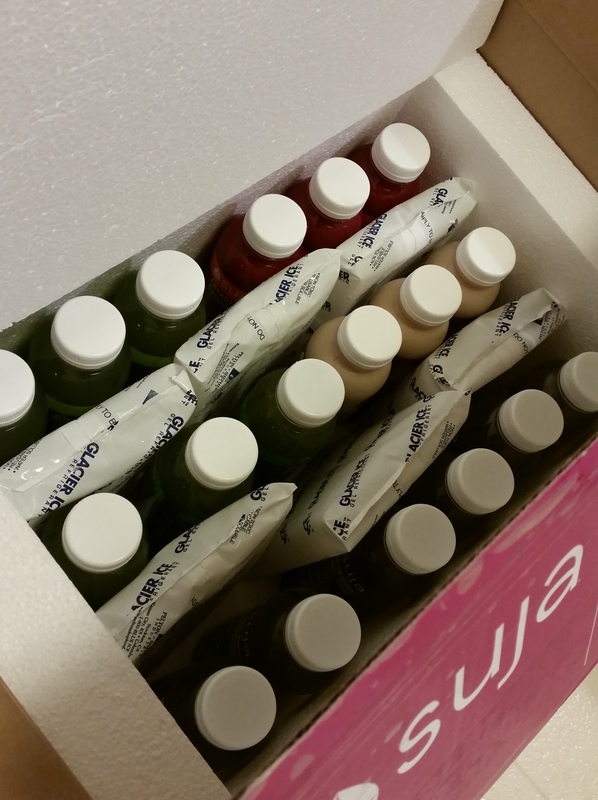 Boxes guard my doorway…great icy cold preservation of these priceless juice gems! 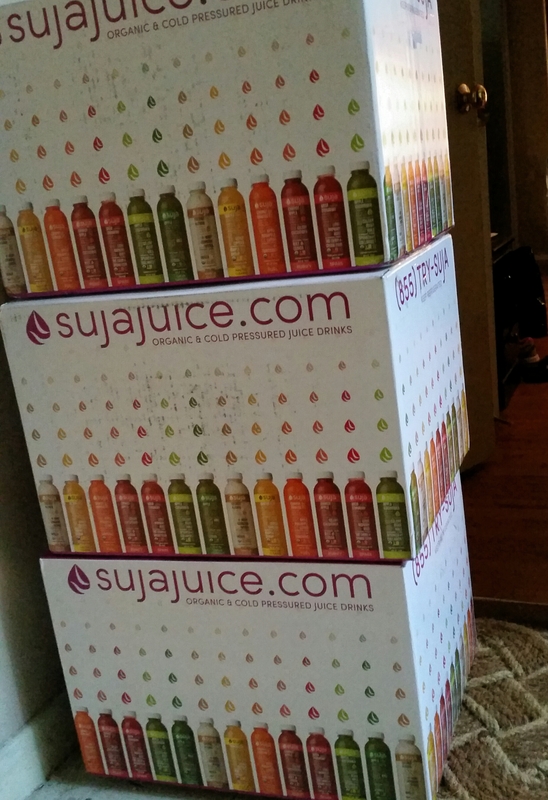 Our SUJA 3 day juice cleanse has arrived so we will begin on Saturday and go through Tuesday morning! That means getting my body more ready to release all that it wants to mop up and discard. I opted for the more advanced Core Fresh Start series and my hubster is a newbie to juice cleansing, so he got their more fruit-oriented Original Fresh Start series. Doing this together is a big deal for us. Honestly, I never thought he would do this! I am so proud and elated at this together-venture! … and the 3rd box is for a fellow juice faster 🙂 ! BTW–If you want to get recipes for juicing, feel free to go to Marching to a Newness Fast that was a 30-day log of a juice cleanse to help my body heal itself from a myriad of maladies. BLEND UP AND ENJOY.. should be rather thick, but comfortably sippable through a straw. 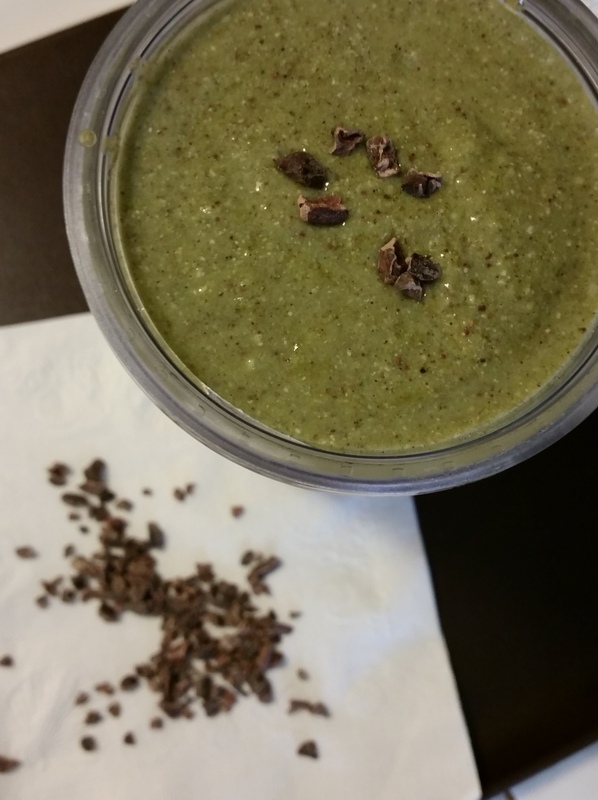 Since I have gotten used to having unsweet foods, this was plenty rich and sweet enough for me.. even the typically bitter cacao nibs had a tinge of savory sweet that was very satisfying! DAY 2: KITCHEN CLEAN UP DUTY! 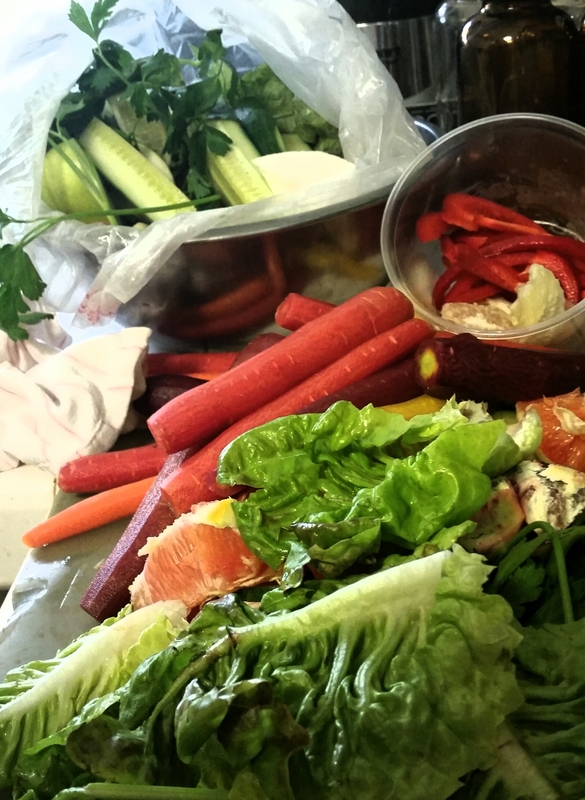 Spent hours today prepping foods to finish off or prep for added juicing during the SUJA juice fast. Made a super satisfying soup of spinach and baby broccoli in a base of homemade organic Turkey broth frozen since Thanksgiving… omigosh… it was rich and creamy without potatoes or cream! amazing! I love how simple foods become literally so alive while eating this “clean.” Garlic, onion, jalapeno smidge, in olive oil and salted to taste. Nature is just divine!~ I do admit, the savory turkey broth (simmered for 12 hours) set a good foundation for this smooth soup. DAY 3 : PRE-FAST MEAL: gotta go read my yelp review on this amaazzzzzzzing organic restaurant in the center of Hollywood, CA!!! DAY 6: LAST JUICING DAY! I treated myself today and bought a freshly cold-pressed juice at a nearby juicery to get extra ginger kicked in to keep my digestive system onpointe. I found myself kinda sad that my juice fast was ending because I do enjoy the freedom from my tendency to eat too much at the drop of a hat…the habitual crutch of chewing to gloss over stress or other inner pressing matters. So, I took this sadness and turned it into a moment to acknowledge the accomplishment it is–that I have a clean slate to work from to continue my unprocessed food fast and mindfully take a pulse on my entire being before plowing in to my pantry. I can be proud of myself! Yea! DAY 7: MY MOLAR, OH MY~ Had a great root canal performed by a specialist in his field (and an old friend I got reconnected with because of my ouchy tooth! 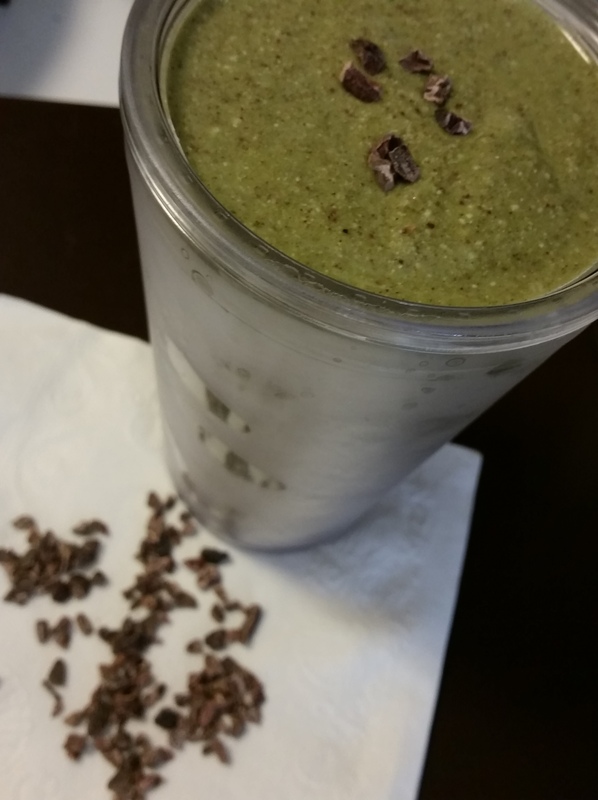 )… Painless procedure, but my jaw is a bit sore…so I am thankful that it is something helping me phase in post-juice-fast foods… soups and smoothies and avocados before I get back to full meals. All things do work together for my good… I am so blessed! 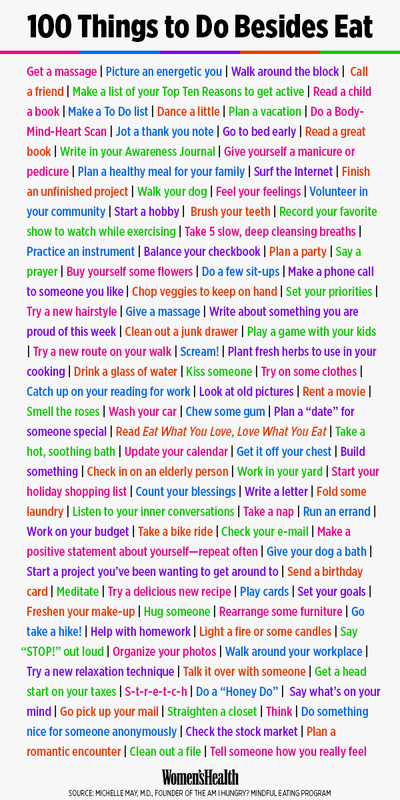 And check out this cool list of things to do besides eating! This is worth making the button to a great week…!